What a relief it was to flee the dreaded Polar Vortex for sunny south Florida! Attendees came from all over, some with harrowing stories of delays and rescheduling as ice, snow, and bitter temperatures played havoc with flight plans. 28 states of the US were represented, and another 23 people flew in from Canada, the UK, Europe, South America, and the Caribbean. The Duncan Center was, as promised, a quiet, secluded, little Paradise in the heart of Delray Beach. 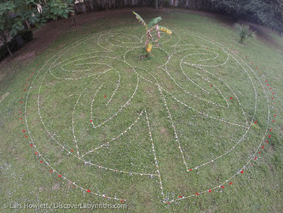 Palm trees, flowering tropical plants, butterflies; swimming pool, hot tub, deck chairs; air-conditioned dining room, sunny patio, comfortable rooms, friendly staff; a beautiful inlaid marble Chartres labyrinth in a cool serene chapel, and another one outdoors under the trees—who could ask for more? 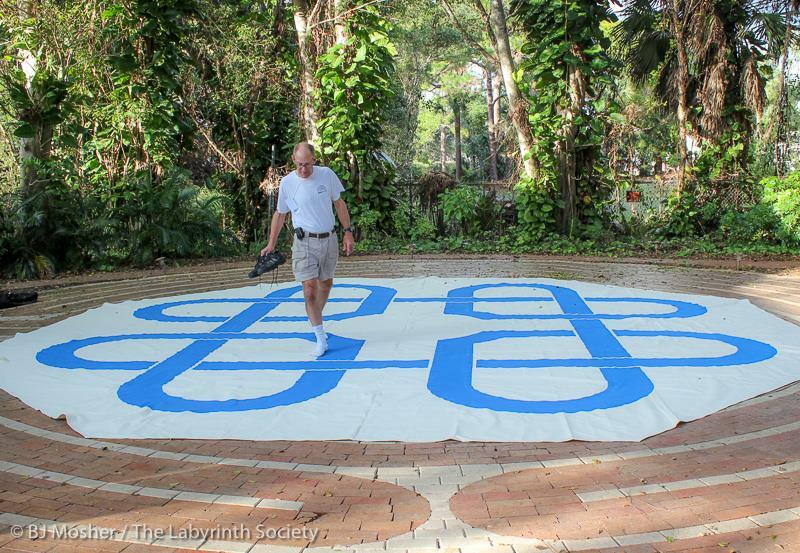 The Board of Directors arrived early, working hard at the all-day meeting to get Labyrinth Society business settled, new members oriented, crossroads discerned, and progress in the Strategic Plan consolidated before Friday’s opening events. 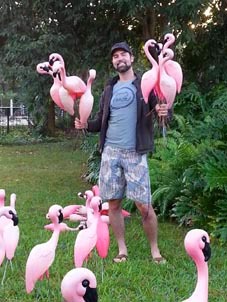 Suddenly … there were FLAMINGOS! Lars' seven circuit "in a quieter corner,"
and Tony Christie’s Scrub Pine Cone. 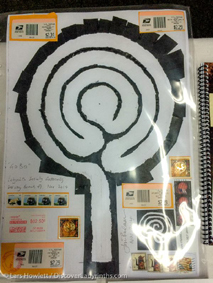 and Carol Maurer's Domestic Goddess Labyrinth (for sacred encounters with a sinkful of dishes) appeared in the Silent Auction! 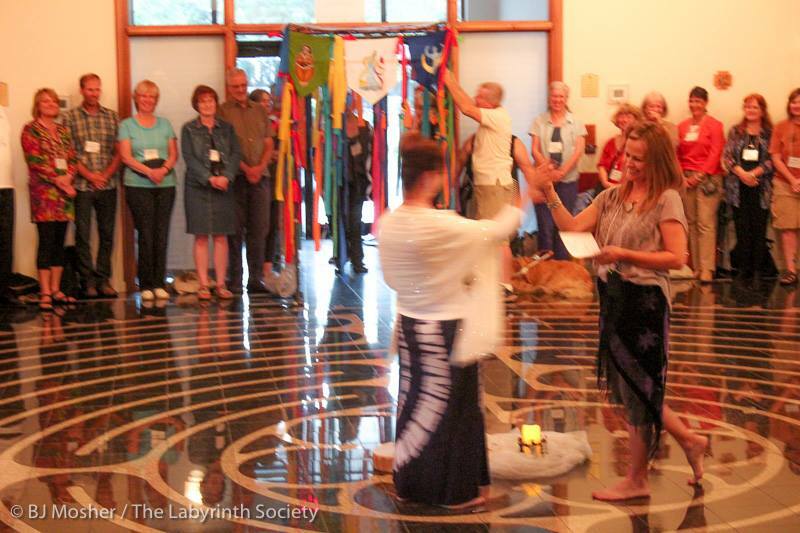 The Opening Ceremony took place in the Duncan Center Chapel, facilitated by Debi Kermeen, with assistance from Annette Reynolds and Marty Kermeen, all founding members of TLS. 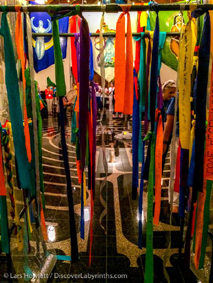 First we created the Threshold, made up of all our intentions written on the brightly colored cloth strips we had received at Registration. Debi Kermeen and Annette Reynolds and Marty Kermeen, led us in a ritual of welcoming and intention-setting. Later on, newcomers were welcomed at a special meet and greet event in the Chapel. The members of TLS had an opportunity to thank outgoing President John Rhodes for his skillful and long-sighted leadership. During his term as President, John guided the Board through some challenging times as we figured out how to implement the Strategic Plan and lay the foundations for the future of the Society. A gifted facilitator, he kept our diverse and highly opinionated group on track and motivated with warmth, good humor, and an old-fashioned courtliness. It's worth remembering as well that TLS' thriving Research group owes its existence to John's tireless commitment. 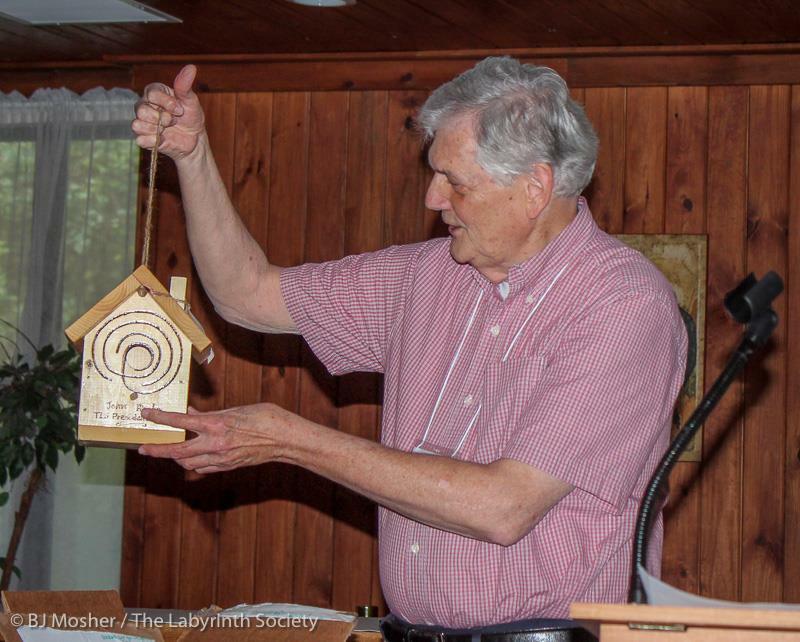 The custom-built bird house, presented to John by the Sunshine Club President Diane Terry-Kehner, represents not only John's interests in birding and labyrinths, but also his gift for incubating and fostering new initiatives. Thank you, John Rhodes! 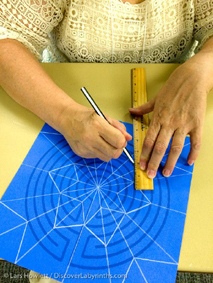 During his keynote address Jim Buchanan described the process where TLS Members were invited to collaborate on making the GOBO projection, and we got a look at the final GOBO design which Jim had donated to the Silent Auction. The Silent Auction, ably organised once again by Dan Raven, was another highlight. With many handmade works of art, beautiful jewelry, books, and historical artefacts (even a vintage 1989 Alex Champion-designed Viking Maze teeshirt!) donated by our talented and generous members, the competition was ferocious. 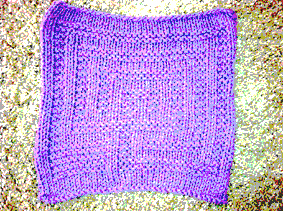 Muttered comments along the lines of, "She outbid me, the little brat!" filled the air as Dan mercilessly worked the crowd to a frenzy during the countdown. All in a good cause: when the dust had settled, the Auction raised $997 for the scholarship fund! The light heartedness was balanced by the recognition of our growing impact in the world of ideas. Hosted by TLS Director of Research Dr. Diane Rudebock, the Research Circle had its best attendance yet, with a significant representation from the international community (triggering a noisy outburst of hockey-related camaraderie amongst the Canadians. Sorry "aboot" that, eh?). The decision several years back to establish a “blind” (peer-reviewed) submission process for the workshop selection has encouraged much more participation by the scholarly community, a major accomplishment for TLS as a contribution to knowledge creation. 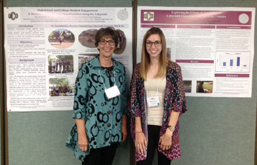 Dr. Rudebock and her student Kaitlyn Burnett, a senior Community Public Health student from the University of Central Oklahoma in Edmond, OK, presented their recent projects at the TLS Poster Session. Dr. Rudebock has brought university students to four TLS annual gatherings in recent years and encourages others in TLS to reach out to form mentoring relationships with High School and University students. 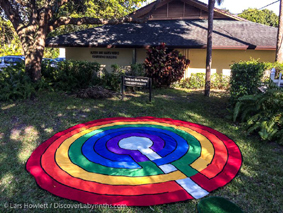 Engaging students in TLS provides opportunities to network with professionals and learn about ways the labyrinth can be incorporated in a multitude of activities in the community, and school and university settings. 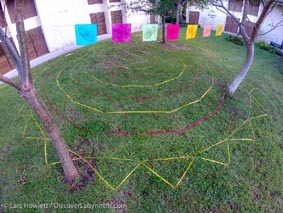 Forming relationships with universities also opens the door for continued research efforts focused on the effects of interacting with the labyrinth. The keynote speakers, Sig Lonegren, Jim Buchanan, and the Turning Point group Zara Renander, Kerry Holder-Joffrion, and Ray Bennett, offered very different views on liminal space. 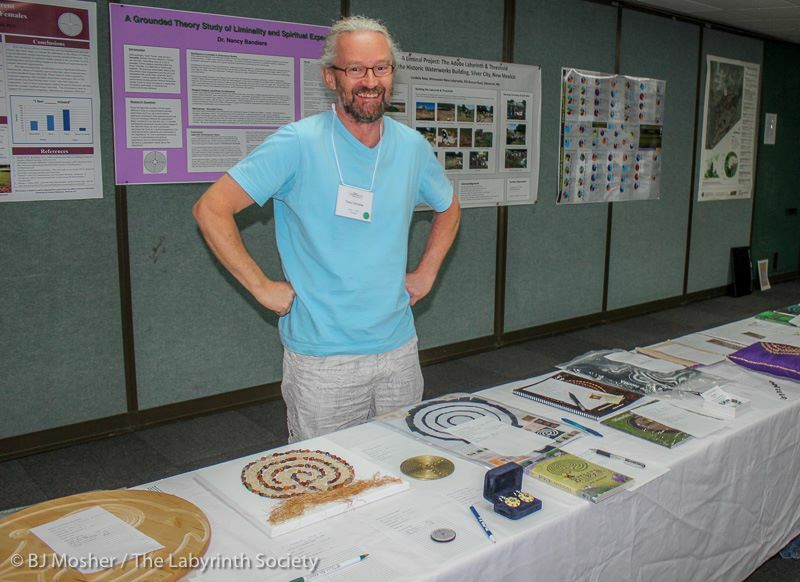 Sig's autobiographical tour began with growing up dyslexic and took us, spellbound, through the theory and experience of archaeo-astronomy, sacred geometry, and the earth energies, with stops on the way for dowsing, Greek and Roman theology, and liminal portals all over the world and throughout consciousness itself. Jim Buchanan's presentation was an overview of his creative process throughout his career, starting with a definition of liminal as "relating to the point or threshold beyond which sensation becomes too faint to be experienced." Using sensation as the thread and focusing in design on the walker's experience, he took us through a "sketchbook" of ideas, including warming up with a page of 3-circuit drawings, designing walks rather than installing walls, "drawing as thinking" and as "continuous movement" with no apparent start or finish, the challenges of working on the beach, radius as body height, breathing and walking, working with the emWave, a biofeedback tool registering heart coherence, its impact on his designs in sand, the horizon as porous and elusive. It was both beautiful and fascinating. A very different, terrible beauty unfolded in the Turning Point presentation, a scripted "conversation" amongst the three Christian ministers on the use of the Labyrinth as Honor Walk in the treatment of Post Traumatic Stress Disorder in American veterans, that opened with an image of a labyrinth set up by the group beneath the looming bulk of the Space Shuttle Pathfinder for a Veterans Day walk, and accompanied by a jarring quasi-military soundtrack reminiscent of Tom Waits. 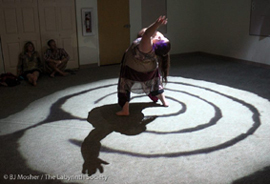 Predicated on the idea that PTSD is a disorder of identity rather than anxiety, the team uses the labyrinth as a mythic container within which to unpack and reframe the experience of the troubled veterans, for whom the suicide rate is 32% (to say nothing of the violence, homelessness, and addiction rates in the remaining 68%). Powerful in content, extensively researched and grounded in myth and depth psychology, admirably professional in its delivery, the experience for the audience was memorable, moving, and deeply troubling, especially for those who question the wisdom and morality of US foreign policy and militarism. That a TLS Gathering hosted such a controversial event can be taken as a sign of our organisation's maturity. We are currently in dialogue with Turning Point about ways in which to connect with and support one another, and will keep our members posted about this important opening for our work in the world. Thanks to José F Cuesta who gave a very generous donation and moving speech at The Gathering about the need for a Spanish translation of the TLS DVD. 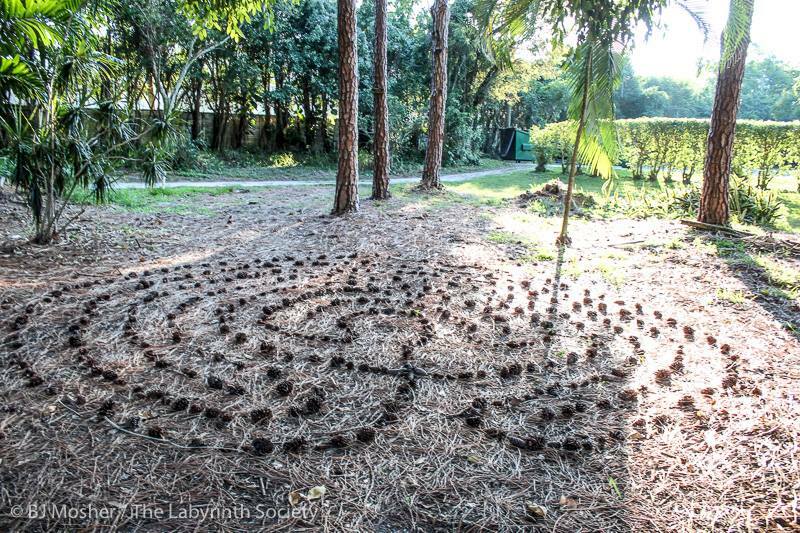 He spoke first in Spanish with images in the background of his work with labyrinths in Colombia. The audience was mostly English speaking. I found myself confused, interested, and frustrated while I wondered what he was saying. I realized this is the exact experience most Spanish speaking people must have of our current DVD which is only available in English. José ended his speech with an English translation and offered a very generous amount toward the Spanish translation project which was donated by his Colombian friends and labyrinth enthusiasts. It was a very powerful way to make the point. THANK YOU JOSÉ! 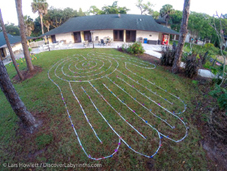 Finally, if you couldn’t make it to Delray Beach this year, there are many collections of wonderfully evocative images, (including Warren Lynn’s Drone-enabled photography!) 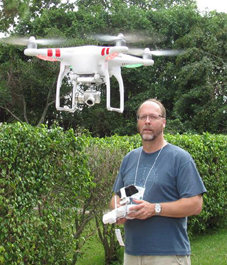 accessible especially easily through the TLS Facebook Gathering page and Lars' Gathering album. The Gatherings truly are the heart and highlight of the TLS experience, and the Gathering team goes to great lengths to make each one unique, accessible, enjoyable, and filled with warm memories. 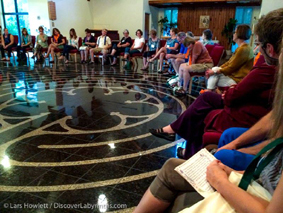 See you at next year's Gathering, "Branching Out", October 16-18, in Waycross, Indiana!